Wuitchik, S.J.S,, Barrett, RDH, and Rogers SM. Linking physiological and behavioural traits during responses to temperature in threespine stickleback (Gasterosteus aculeatus). 66. Jamniczky, H., Le, A., Barry, T., and Rogers, Sean. 2018 Freshwater influence is associated with differences in bone mineral density and armour configuration in threespine stickleback (Gasterosteus aculeatus). FACETS, pdf. 44. Dennenmoser, S., Nolte, A.W., Vamosi, S.M. and Rogers, S.M. (2015) Phylogeography of the prickly sculpin (Cottus asper) in north-western North America reveals parallel phenotypic evolution across multiple coastal–inland colonizations. Journal of Biogeography 42(9):1626–1638 in press. 43. Jamniczky, H.A., Campeau, S., Barry, T., Skelton, J., and Rogers, S.M. (2015) Three-Dimensional Morphometrics for Quantitative Trait Locus Analysis: Tackling Complex Questions with Complex Phenotypes. Evolutionary Biology 42(3): 260-271, in press. 39. Jamniczky H.A., Barry, T.N., and Sean M. Rogers (2015) Eco-evo-devo in the study of adaptive divergence: examples from Threespine Stickleback (Gasterosteus aculeatus). Integrative and Comparative Biology, 55 (July): 166-178 pdf. 24. Rogers, S.M. (2012) Perspective: Mapping the genomic architecture of ecological speciation in natural populations: does linkage disequilibrium hold the key? 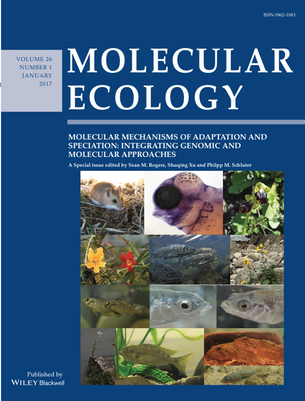 Molecular Ecology 21: 5155-5158 (link).